The scientific name for the iguana is Iguana iguana. It is native to Central and South America living primarily in the rain forest canopy. They are also found on some of the smaller islands of the West Indies. They are one of the most popular reptiles even though they are quite difficult to care for properly. They are not recommended for the amateur reptile keeper. The continued destruction of the rain forest which is their natural habitat, and the demands of the pet and wildlife trades have placed the Green Iguana on the threatened species list. Formation of farms breeding iguanas strictly for pets is helping reduce the number taken from the wild though it compromises the genetic diversity. In some areas indigenous people hunt the iguana for food and iguana eggs are boiled in salt water and sold as a novelty food. They are a very sturdy reptile and can fall 50 feet from a tree and be unhurt. Iguanas are very strong swimmers. The green iguana can weight up to 20 pounds and get about 6 feet long. Green iguanas actually come in different colors ranging from greens and browns, to bluish greens, lavenders and even reds and pinks. They have leathery scales, short legs and a long hard tail they can use as a whip weapon. They have very long toes with claws and have a row of spine down their back and tail to help protect them from some predators. Both the male and female have dewlaps under their chins with the males being larger. This helps regulate their temperature. They will also use the dewlap as a courtship display and territorial warnings.Males have a dorsal crest that may reach 3 inches high. Their teeth are serrated. *UVB light or their bodies cannot produce vitamin D3 that promotes calcium absorption. No UVB can result in a metabolic bone disease. *A baby iguana, up to 7" long, can use a 55 gallon aquarium. You will need to buy a lid which is a soft meshed cover to keep the pet in. * the width and depth of the enclosure should be 3 times the length of the iguana and the height should be 4 times the pet's length. If you have 8' ceiling and a large iguana, make the cage wider. * As with many other reptiles loose substrate can cause impaction. Better to use any solid substrate unable to be ingested by the iguana, news paper, butcher's paper, linoleum, reptile carpet and artificial grass are some substrate safe to use. ***Iguanas do not do well in enclosures that are made out of un-coated wire, they will rub their nose on the metal causing raw, open wounds. Your iguana requires only vegetables and fruit, not animal protein. Since they are herbivores their metabolism does not digest and metabolize protein well. A diet with to much protein leads to renal and liver disease. The prepared iguana diets on the market contain animal protein which they do not need or want. The prepared iguana diets also contain wheat which iguanas do not digest well. Wheat also has oxalates which bind with calcium making the calcium unable to be absorbed and utilized. It is best to feed the iguana fresh vegetables and fruit. The amount of fresh greens in the iguanas diet should be about 50% with the rest of the diet being made up mainly of freshly shredded vegetables. The iguana should not be given more than 10% fruit. Tricia's link below has good dietary recommendations. The Iguana sheds in pieces rather than in one piece. The skin getting ready to shed takes on a dull dusty appearance eventually turning a lighter grayish white. The iguana will try to aid in the removal by dragging and rubbing itself on objects. While an iguana is growing they will shed more often than they do when adults. You will want to pay special attention to toes, tail and spikes. Retained shed on these areas can cause poor or no circulation making them at risk for loosing that part. Males become quite aggressive during mating season. Females will also become aggressive but not nearly so as the males. Females lay clutches of 20 to 70 eggs once a year. The eggs hatch after 10 to 15 weeks of incubation. Though the females lay the eggs and then leave, the hatchlings will search for and stay with adults familial groups for about the first year of their life. .
Iguanas are wild animals. They must be actively worked with to tame them. This means spending at least 30 minutes daily talking to and handling the iguana. Being cautious while taming is advisable. When frightened or feeling threatened iguanas will scratch, bite and/or tail whip in defense. As it is with most other reptiles, most common problem stem from poor husbandry. Metabolic Bone Disease is the most common problem. It is avoidable with proper temperatures for digestion and absorption, proper diet, and calcium supplement. The information presented here and so much more is found by following the links below. Extremely informative page detailing the many things that can go wrong with your green iguana and remedies, tips and information to help you get back on track. Detailed green iguana care sheet from Tricia's Water Dragons. Smithsonian National Zoological Park Green Iguana fact sheet. Ron Hines, DVM PhD comprehensive iguana care guide. The Iguana Den covers every aspect of iguana care in great depth and detail. 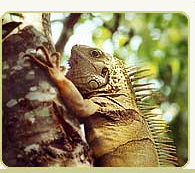 From iguanafoundation.org, an 82 page document detailing many species of iguanas with pictures, as well as detailed descriptions and pictures of iguana habitats and requirements.